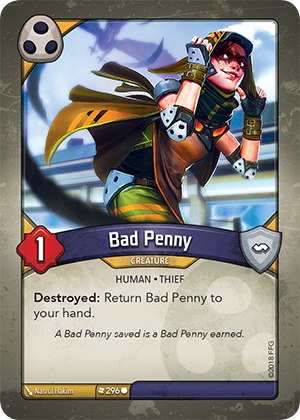 Card Text Destroyed: Return Bad Penny to your hand. Flavor text A Bad Penny saved is a Bad Penny earned. If I take control of my opponent’s Bad Penny and it is destroyed, does it go to my hand? No. When cards that changed control leave play, they always return to their owner’s appropriate out-of-play area (such as a hand, deck, archives, or discard pile). In this case, Bad Penny would return your opponent’s hand. What happens if Bad Penny is destroyed by Stealer of Souls (“After an enemy creature is destroyed fighting Stealer of Souls, purge that creature and gain 1 Æmber”) or Yxilo Bolter (“Fight/Reap: Deal 2 damage to a creature. If this damage destroys that creature, purge it.”)? Bad Penny goes into its owner’s hand. ““Destroyed:” abilities resolve immediately before a card would be destroyed. Therefore, Bad Penny would return to its owner’s hand, after which Stealer of Souls and Yxilo Bolter cannot purge it anymore. The controller of Stealer of Souls still gains 1 Æmber from the second part of its ability.